For certain services, each state will require someone who plies their trade in a particular field to get a business license before being able to practice their business. Even your hairdresser is required to have a license. Chemical scalp burn anyone. Same as your electrician, plumber, painter, landscaper and yes, your Realtor too. Without a license, the company cannot legally perform the work. To get a license, the business owner and their employees will be required to be licensed. The owner of Barbara’s No Drip Plumbing will need to get a business license and both she and her crew will be required to have professional plumbing licenses. Getting the license requires training, demonstration of the required skills, plus continuing education to maintain that license. As with any profession, just because someone is licensed doesn’t mean that they are any good at what they are licensed for. You need to research the company and get references. What does it mean when a company is bonded? This is probably the term that most people misunderstand the most. A company is said to be bonded when it has purchased a surety bond. A surety bond is all about a company's reputation to follow through. A surety bond is a promise and a guarantee that they will complete the work they agreed to do. It's a promise that they will follow the rules and regulations of their particular trade. If a company fails to meet their obligations, the customer can make a claim against the bond. Say the contractor your hired to remodel your Brady Bunch era kitchen into your Houzz-worthy, dream version, fails to complete the work as agreed to in the contract. If the contractor is bonded you can go after that contractor's bond to get compensated. If your claim is successful, the surety company will pay your claim. For a regular insurance policy, the policyholder pays a deductible and the insurance company pays the rest. However, for a surety bond, although the surety company will pay the homeowner who filed a successful claim against the contractor, the contractor will be required to pay every penny of the claim back to the surety company. The surety bond essentially allows the contractor to "borrow the funds" to pay the claim. With a surety bond, a company is essentially paying a few hundred dollars a year to get access to a line of credit in the event that they screw up. The surety bond is there to protect the public, not the contractor. You file your claim with state’s contractor board. The system does have some limitations: before filing, you might first be required to claim directly against the contractor. Are there sufficient funds within the bond to cover your individual claim? Your contractor might be subject to numerous claims and the bond has to be shared. A general contractor needs to carry a lot of insurance both to protect themselves and you the customer. Two commonly policies are general liability insurance and workers compensation insurance. Say a roofing company is up on your two-story home adding a new roof. One of the roofers is not wearing a safety harness, slip and falls to the ground and break their pelvis. A few weeks later you get a bill in the mail for $50,000 in hospital fees. WTF! Why am I getting this? In addition, your home insurance will likely not cover such a claim if you knowingly non-insured, non-licensed company. The contractor's general liability insurance protects the homeowner against damages such as the contractor collapsing your sewer line or flooding in your basement due to a bad plumbing fix or scratching up your beautiful hardwood floors with their heavy equipment. How do I find out if a company is licensed, bonded and insured? The easiest way is to just ask them. But don't rely on them completely. If the contractor says, "why, yes of course we are!"... 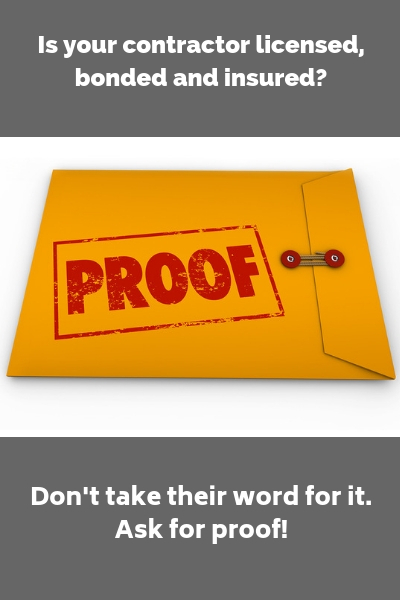 ask them to provide proof for each of the 3 items. A competent company will provide you copies of all 3 during the bidding process. If a company says they are licensed, bonded and insured but drag their feet providing your copies, that might be a bit of a red flag. Once you get the copies, make sure to read them to confirm they are current and up to date. Feel free to call the insurance and bond providers to confirm the information is correct and not out of date. You can also visit the website for your state's Department of Labor and Industries for your state. For example, for Washington State, you can go to the "Verify a Contractor, Tradesperson or Business" section, enter the business and up pops their current licensing and bonded status. The company's insurance policy will not be listed on the site. You will need to get a copy from the contractor and call their insurance provider(s) to confirm that their insurance policies are up to date and covers the type of business they practice. And if the company doesn't have general liability insurance... well you are probably screwed and will have to chase them through the courts to get compensation. Good luck with that! Note that the general contractor also takes responsibility for any sub-contractors that they might use on the job. Should I ever go with a company that is not licensed, bonded and insured? Well, that totally up to you. You’ll probably pay significantly less than a compatible bid from a fully covered company but you might be taking on significant risks too, you will not be covered in the event things get ugly, plus you might end up with potentially sub-standard, non-permitted work. 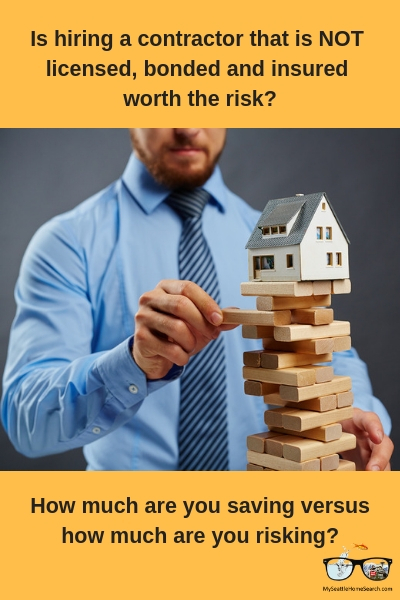 Plus when you go to sell your home, buyers might want to know who did the work, whether they were licensed, bonded and insured, did they get the required permits and inspections, and was the work done to code? 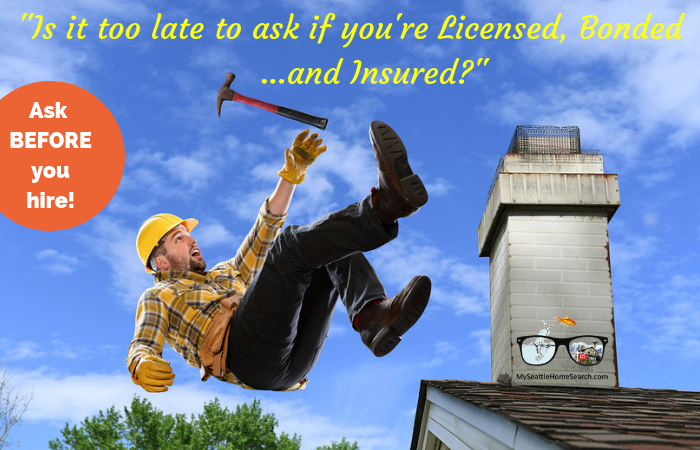 Ask yourself why the contractor is not willing or able to be licensed, bonded and insured? Did they lose their business license,? Did they fail to qualify for a license or they just don’t give a crap and are intent on ripping you off with shoddy work and materials? Is it worth the risk? Yes, you can save some money, but can also lose a lot more than you save. You will have to weigh up the pros and cons for yourself based on the particular work you need to be done. And remember, just because a contractor is licensed, bonded and insured does not mean they are good company. Get references, ask to see their work on completed projects, check their BBB rating for any claims against the company, check out their ratings on the web an social media. A shiny truck with a catchy logo does not guarantee good service. If you have done your homework, selected a rock solid company AND they are fully covered, well, then you are ahead of the curve and have greatly improved your chances of a successful outcome. Tips For Hiring The Best Contractor For Your Home from Paul Sian. Tips for Building a Structurally Sound Relationship when Hiring a General Contractor from Anita Clark. What to do About Unpermitted Work when Buying or Selling a Home from Bill Gassett. The above article was written by Conor MacEvilly. Conor is a Realtor with RE/MAX on Market and lives in the Ballard neighborhood of Seattle. He works with both home buyers and sellers in the greater Seattle real estate market and on the Eastside in neighborhoods like Redmond, Bellevue, and Kirkland. Conor can be contacted directly via his cell at 206-349-8477 or via email at conor@remaxonmarket.com. To learn more about what makes Conor tick, click here.